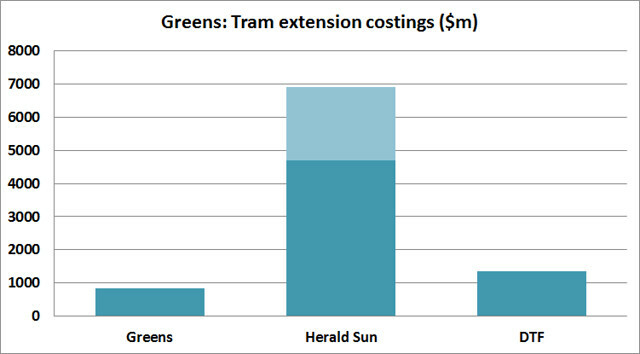 The Greens have policy going into the State Election for 17 smallish tram extensions. Mostly they make a lot of sense — extending many tram routes from their current outer termini in the middle of nowhere (a hangover from when trams and railways competed) to a more logical point such as a nearby railway station or shopping centre. This helps ensure both ends of those routes go to somewhere useful: a traffic generator such as Chadstone, or providing better connections on the public transport network. The only one I’m doubtful about is extending route 82 from Footscray to the City. Given the route would go through the mostly empty port area, I don’t see the point, as passengers for the city have some of Melbourne’s most frequent trains (which are faster) or some of Melbourne’s most frequent buses to get them there. Personally I wouldn’t see it near the top of my wish list until there’s some redevelopment around the port. But in any case, the Greens’ estimate for all this was $840 million. Wednesday’s Herald Sun savaged it, comparing costs with brand new light rail networks interstate such as the Gold Coast Light Rail system, and extrapolating a per-kilometre cost. The problem is they forgot about new system establishment costs such as depots and fleets aren’t applicable to short extensions to existing systems. They came up with a figure of $4.7 to $6.9 billion. They used that and other estimates as the basis of an editorial accusing the Greens of threatening the state’s economic stability if they won the balance of power. The Greens had submitted their policy to the Department of Treasury and Finance for an independent estimate. DTF published that yesterday afternoon (along with a bunch of others). It came out at $1.36 billion. Not as optimistic as the Greens, but a long way from the Herald Sun estimate. The full DTF document is worth reading for future reference: in summary it says tram lines should cost in the region of $15 million per kilometre, with additional costs for platform stops ($1.7m each), works for major intersections ($2.8m each), substations (for extensions over 5 kilometres $5m each) and terminus works ($5m each). The Hun clearly has no credibility on transport. It’s desperate attempts to polish the East West Link turd should now be seen for what they are – partisan barracking for a government in the pockets of developers. Footscray – Your blog post neglects the fact that the tram would link Footscray with Docklands, something the train doesn’t do currently. A tram extension along Footscray road might allow for the bus service to be removed, and those resources used to boost the remainder of the bus route between Sunshine and Footscray. Would I provide this extension if I had an opportunity? Absolutely. But it would not be my priority and I’d consider several of the other suggestions before it. Park Street – Seems completely pointless, considering that route 1 runs into the city along Sturt Street. Fulfilling this link would require a massive reallocation of routes and resources. I believe this one is completely unnecessary. Gowrie – Also pointless. Catchment along this route predominately only exists along one side of the proposed route. Also completely duplicates a train line. This would be better serviced with improvements to local buses between this area and Coburg on the routes 530 and 531. The others are worthy extensions and should all happen. I would love to see this plan get up. The idea of the Park Street link is to enable a cross-suburban route from Toorak/South Yarra over to South Melbourne (either to the beach or to the western side of the CBD I guess), so more of those types of trips can be done more quickly, without going via the city. Yeah I agree with the point on Gowrie, I’m not sure I understand the logic there. Daniel, re: Park Street, of course! Didn’t think of that. I should have, given that there was a plan some time back regarding a re-organisation of tram routes which involved sending the route 5 tram into the city via Park St and Clarendon St. Totally forgot about this, but it’s a good example of what Park Street could achieve. Point taken. The costs seem small for the benefit. Surprising no one has thought of those extensions before. It partly depends on whether you lump a bunch of roadworks (ie. widening the associated road) in with the cost and build those overengineered superstop things. I actually think the Green estimate is a bit on the high side for the tram gap-filling program, if they were just done as conventional tram extensions. When framed against the Hun’s estimate it looks like a big “win”; but DTF is saying the real cost is 62% higher than what the Greens claim. That’s a pretty big difference and reminds us all not to take party political promises at face value. But having said that, I don’t have much confidence in DTF’s estimate. Looks like a rushed compliance exercise with little real analysis. Not all of the extensions are small. Seven are 4 km or longer and three of those are 6 km or longer (Vermont Sth to Knox is 7 km). Only three are less than 2 km. For context, the new Gold Coast and proposed Canberra and Sydney lines are circa 12 km each. Extending an existing network no doubt provides some cost savings compared to a completely new system, but I’d like to know how Melbourne’s network can be increased by 56 km in total (circa 22% increase) and yet no additional trams are supposedly required? Some reasonable stuff in there but a) we’re going to need even more trams to cater for the extra trips and b) surely you’re going to need more depots to house said trams. Drive past one of the tram depots at night now and you can see there’s no space left. Would there be space for another depot at the city end of the Footscray link and out in the Knox end of the Route 75? There’s certainly never going to be another depot plonked into the middle leafy suburbs like Kew, Camberwell, Glenhuntly etc.. If undertaken with tram priority at the same time (speeding up existing services) it could be possible to accomodate minor extensions without increasing the fleet or changing service intervals. Tram priority at most interesections should be pretty cheap (a T light, a sensor, that’s about it), although of course that should then be part of the costing. I don’t know the current fleet utilisation, but certainly there would be tons of spare offpeak capacity – and maybe the way Metro has gotten extra out of its fleet by being clever about maintenance regimes could be applied to the tram fleet? (to keep greater % of fleet in service at peak). I would not stop this extension at Gowrie but continue it further to the Campbellfield shopping centre precinct. The railway Stations of Gowrie and Fawkner provide a wide catchment, but the tram extension would increase patronage for short journeys up to Campbellfield or down to Coburg and Brunswick. That strip of Sydney Road also features several motels catering to visitors to Melbourne. 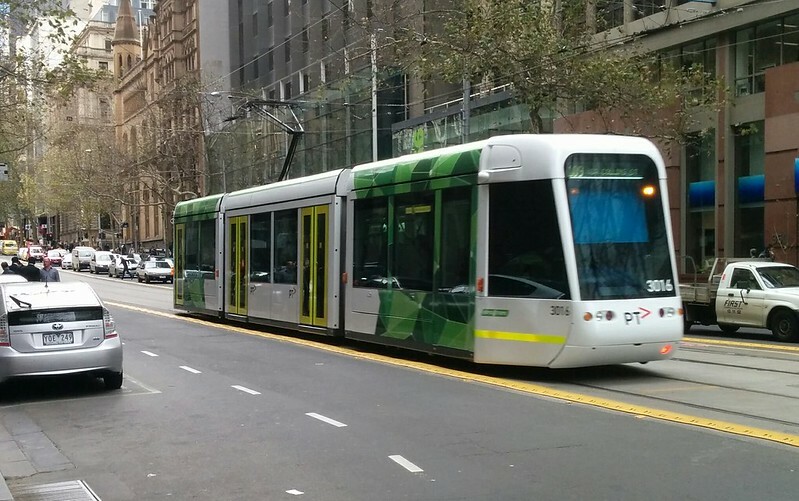 A tram line on Sydney Road would encourage those visitors to leave their cars in motel car parks to catch the tram to Coburg, Brunswick or into the city. The population of Fawkner and Hadfield are also increasing with more medium density sub-development so the extension would also cater to this population growth. An extension to Campbellfield would make a real difference and increase public transport patronage. For the record, I have not seen anything other than what Daniel has posted above in respect to the Greens and Herald Sun articles. None the less I have some comments I can put forward. The area between is just not important. It is what it links at both ends that is important. Having said that, I would prefer to see #82 extended to Yarraville and a new tram run from the city to Tottenham via Footscray. On the same point, I advocate strongly in a bus link between Newport R/S and Port Melbourne, going over the West Gate Bridge, and perhaps out south east a bit too. I guess the plan is to extend #19 to Gowrie? I like the idea of extending the #19 to Fawkner, to get the tram terminus out of the street and get decent room to perhaps build two turnback tracks for better capacity. It would also better connect with trains, and Fawkner being a point of interest in its own right. I would not extend it to Gowrie. It would be better to have so many trams terminate at Moreland in both directions. From Fawkner/North Coburg to help feed people to the train at Moreland, and have a minimum through service. I somewhat support the views in respect to, the trams just stop out in the middle of nowhere, and this is something of a great cost to the tram network, and to public transport in general. There is such a lot in respect of how many silly add ons there are to a typical cost for a project. Such as lawyers, and $100,000 just to give a consultant 10 minutes to point this goes here, and that goes there. Perhaps outsourcing is the biggest cost. Do it yourself and you save vast amounts on lawyers and consultants. @Flanders Street I don’t think a tram from Footscray to Docklands isn’t a high priority, if needed you could simply re-route buses to better service Docklands. Also a tram between this 2 places and then remove the bus services along there, might not be a good idea. These buses service a very well used and lot people use them to travel between west and the city. @Tranzitjim Having new routes because they be good as a back up I don’t think is a good basis in deciding if route is needed. As for 82 to Yarraville is it even need? *And though only goes to somerville, there is Bus Route 223 every 15 minutes on weekdays. Noting all that, I think having a tram would just be overkill. As for idea of bus between Newport and Port Melbounre, I think that’d be a good idea. Would save workers in Fishermans Bend who from the west having to go via City to get there. The Northern group of rail lines is badly connected to northern Docklands because they need connecting to get the train to Southern Cross and backtrack. The highest priority to fix this would have to be a tram route through Docklands and E-Gate to North Melbourne. The RRL not stopping at North Melbourne may increase the need for trams between Footscray and Docklands. I would like to know why local traders are so against having accessible tram stops? Surely it would mean more business for them not less? If you are living near the tram you are less likely to drive to the shops any way. It is law that they are meant to change the tram network to have accessible stops and low floor trams I thought? Some of those extensions include roads with a steep gradient … some to the point of making tram travel infeasible. But slight route modifications may be able to compensate.